Pioneer's first power meter set a new standard for on bike pedal stroke analysis, but for 2014 the whole system has been thoroughly re-engineered and re-envisioned, coming out with loads of improvements and features. PEZ takes the new system through its paces and further explores its unique capabilities for pedaling analysis. Pioneer has made a big push into the expanding power meter market. Introducing their first model in North America in late 2013, they have worked with Team Belkin right from the beginning, resulting in the new model I got my hands on at the official launch in mid-March. There’s nothing like having professional riders and mechanics telling you in no uncertain terms what they liked or did not like, and the result is a lot of improved features. The key feature and advantage of the Pioneer over other power systems is the ability to see detailed analysis of your pedal stroke in real time. Not only do you get the left:right power distribution that are now available with some other systems, but you can see the force vector (magnitude and direction) over each 30° of each pedal stroke. Are you riding against yourself by not unweighting your leg on the upstroke? 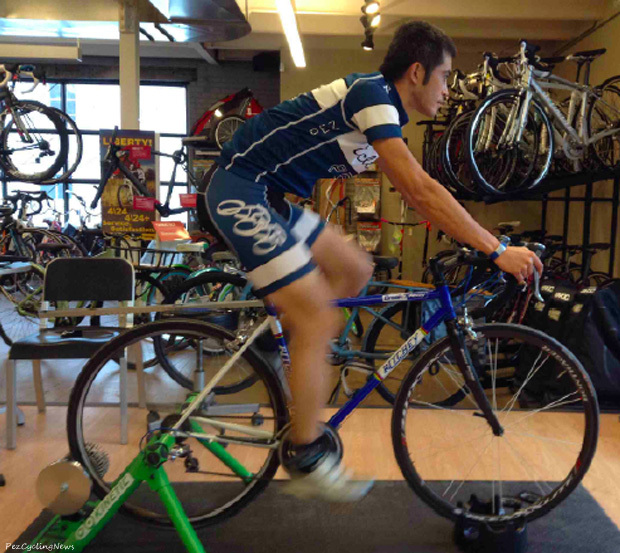 Are you able to generate power over the top of the pedal stroke? Another nice metric with the Pioneer is that of pedalling efficiency (upper right), calculated as the ratio of positive tangential force (force at 90° to the crank’s position that is actually usefully turning the crank) versus total force. Perfection with no wasted power would be 100%, and improving this efficiency helps in actually laying more power onto the road. While not something you can immediately change, I’ve made the habit now of regularly keeping an eye on both my actual pedaling dynamics and pedaling efficiency on the road and in post-ride analysis. Basically, I can go faster by either laying down more total watts, or be better at using those watts to pedal. The Pioneer gives me the tool to track both. You can check out my original review to see that, rather to my surprise, I found a large left leg dominance in my pedalling, with my left and right leg at roughly 55:45% power distribution regardless of power or cadence. As a result of this, my bike fitter and I eventually determined that I have a functionally longer right leg that wasn’t optimally extending. We then used the Pioneer in real time to try out different position changes to even out the power, and it was quite insightful to be able to instantly see the results of each tweak on power distribution. The “after” picture. Ultimately, we: 1) changed the saddle to give me a more stable platform; 2) shimmed my left cleat and moved it forward to functionally lengthen my left leg; and 3) raised the saddle 5 mm to permit fuller extension of both legs. The result since has been that my power output has become essentially even across both legs. Out on the road, I no longer keel over hard onto my left side when I’m riding hard, and feel far more stable on the bike. From an ease of use perspective, the biggest improvement is that Pioneer has streamlined the process of getting their power meter onto your bike. Rather than providing shops with specific (and expensive) jigs to epoxy the units onto your new or existing Shimano cranks, the Pioneer now comes pre-installed and calibrated at HQ. Pioneer has also simplified and expanded your crank options at the same time. While still only available on Shimano cranks, you now have your choice of 9000 Dura-Ace or 6800 Ultegra cranks, in a wide array of lengths and chainring options including 50/34, 52/36, through to 53/39. 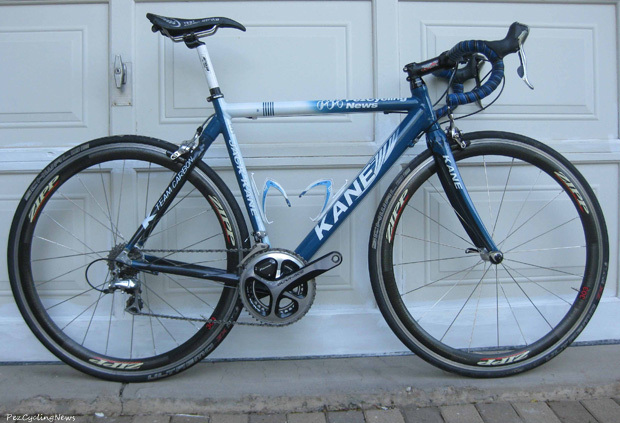 Unfortunately no 46/36 option for cyclocross yet due to the size of the crank-side transmitter, but I can always hope. Accelerometers are now inside each crank monitor, and the batteries remain simple to replace watch-type 2032 ones. All the shop (or you) now need to do, besides putting the cranks onto the bike itself, is to place the magnet dots onto your frame. Being pre-calibrated, the need for the shop to individually calibrate each crank with set weights is also removed. For Pioneer, this greatly simplifies their distribution system, eases the required training of shop personnel, and increases their overall growth potential. Pioneer has also upgraded the power meter system at the cranks. The previous model relied on a magnet ring being placed on each side of the bottom bracket, which often necessitated a new and specific BB. 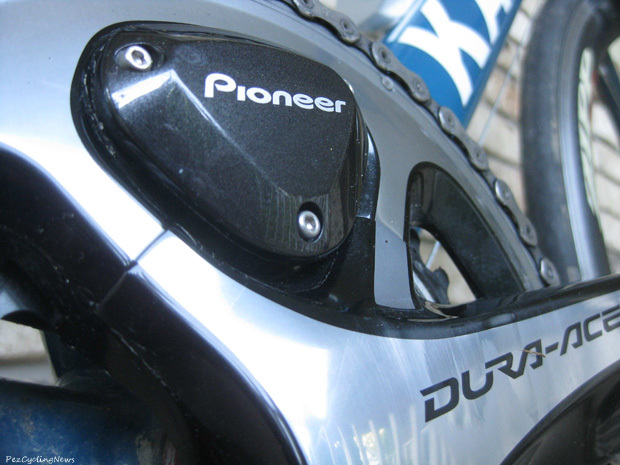 The new Pioneer vastly improves the ease of installation by incorporating an accelerometer into each crank, then replacing the magnetic ring with a simple magnetic dot sticker on the frame. Besides assuring that the dot is a set distance from the crank, the only calibration required is a one-off setting of the location of the magnet dot. Aesthetically, the removal of the bottom bracket ring makes for a much cleaner overall look to the Pioneer setup. 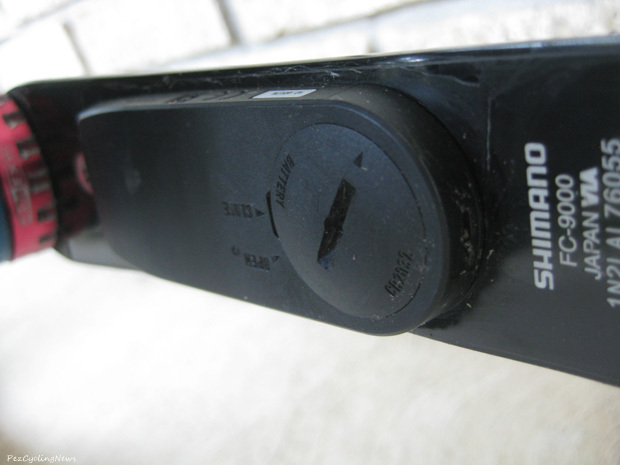 And at the same time, the chainring side transmitter has removed the zip-tie attachment that was derided in initial consumer reaction in favour of directly mounting onto the crank’s chainring bolts. 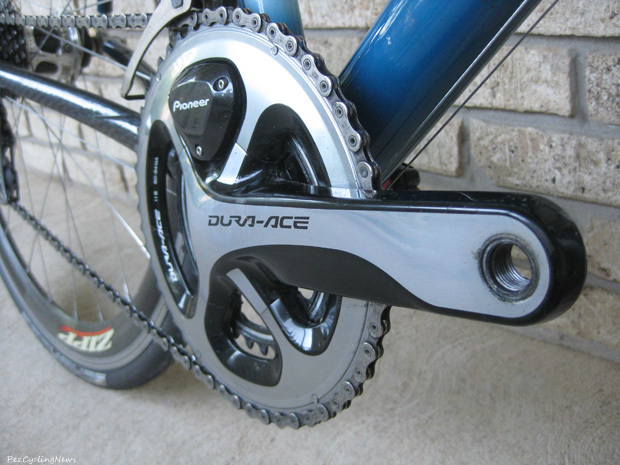 The overall system, from both the cranks and the computer, have been made to be highly waterproof. 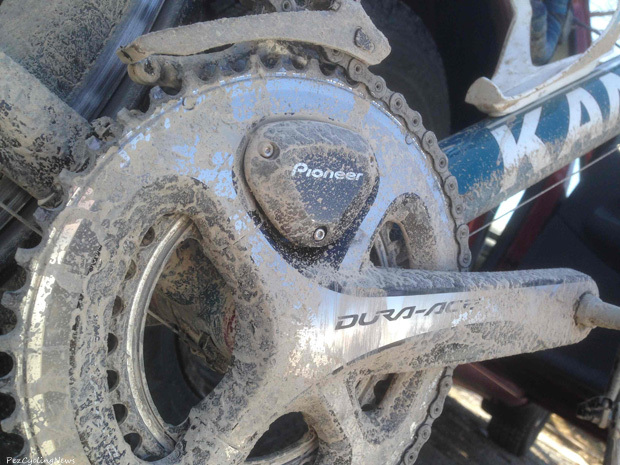 I use my system during a very muddy road/off-road Tour of Bronte race and, while I couldn’t see any data during the race due to the mud flying everywhere, post-analysis showed no data drop or any issues. Overall, the upgrade to the bottom bracket, along with the factory pre-installation of the cranks, makes the Pioneer system both far more reliable but especially easy to set up for shops and consumers. Another big improvement made by Pioneer is the brand-new SGX-CA500 cyclocomputer. The 500 tackles head-on the feedback that the still-available 900 was too big and expensive by somehow pulling off the magic trick of becoming smaller, more feature-packed, and less expensive. The buttons have been moved to the side of the computer rather than on the surface, removing a large amount of real estate. The 500 retains the great features of the 900. Notably, the touchscreen is easy to operate even with full-fingered gloves, and there remains the same vast array of screen options and data metrics to select from. 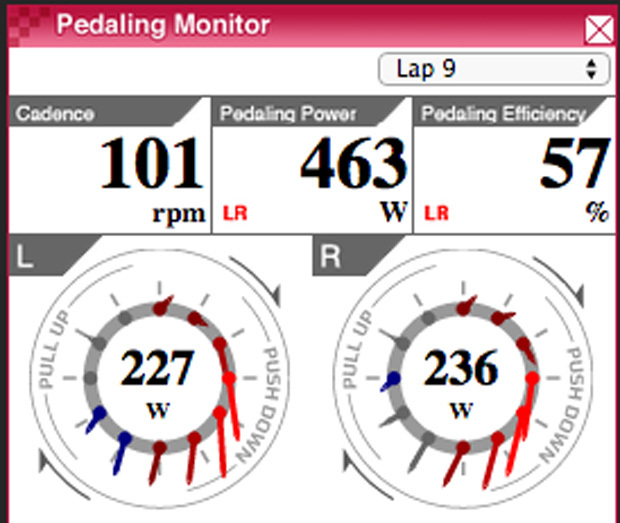 Selecting between different metrics to view is also fairly simple and quick to do even while riding. One feature that the 500 has eschewed is the 900’s colour screen. I actually feel that this is an improvement, as I find the 900 hard to see in bright outdoor sun. In contrast, I found the 500s simple black and white screen highly visible in different outdoor conditions and viewing it at different angles. One great new feature of the 500 is the wireless upload capability. As you would with your smartphone, set up the 500 to find your home network. When I come home and “end” the ride, by the time I get to my laptop the ride is already uploaded to both Pioneer’s own free and feature-packed Cyclo-Sphere software along with Strava. So simple and now I never even need to take the computer off except to recharge it. I can’t overemphasize how addicted I am to this wireless feature, freeing me from constantly trying to remember where I left the USB cable, plugging it into my laptop, then heading out for a ride realizing that my computer is still downstairs in my office. 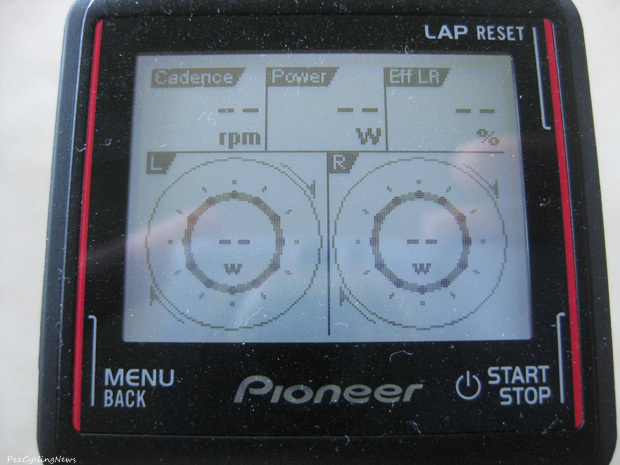 I was a big fan of the original Pioneer power meter system for its unique dual-side analysis. And now I have to say that I'm incredibly impressed and a huge fan of the new Pioneer system. Basically, you're now getting a much-improved system – power meter and computer – for much less money. What I'm especially impressed with is that they've taken pro rider, shop personnel, and consumer feedback to heart, then turned it around to wholesale changes at the hardware, software, and production/distribution channels in a span of months. Keep in mind that I received their first system over Christmas 2013, and they had the new system on my bike at the formal launch party in California in mid-March. That's the power and flexibility of having a big company like Pioneer behind the project. The Pioneer power meter and either the SGX-CA500 and 900 cyclocomputers are sold separately. You can use other computers like Garmin, but you'll lose out on a lot of the advantages of the total Pioneer system. 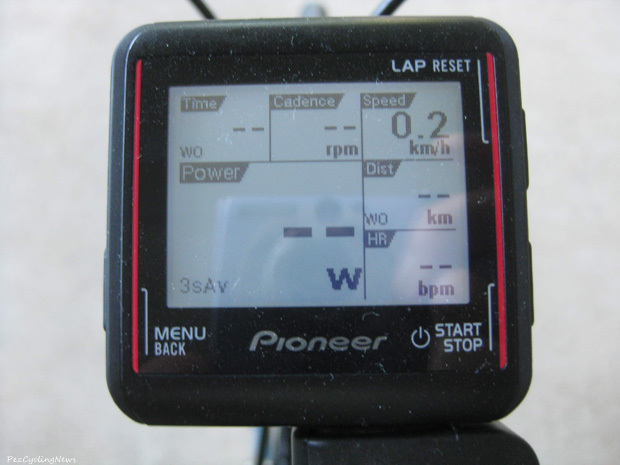 Notably, while a Garmin will display the independent left/right power, it won't be stored for downloading and analysis (total power will be stored), and other computers also will not receive, display, or record the force vector and efficiency data. The Pioneer is available in the USA and Canada through an expanding range of local dealers and online, in 38 different Dura-Ace and Ultegra crank and chainring combinations. Pricing for the power meter is approximately $1550 US (Ultegra) and $1850 (Dura-Ace), and the SGX-CA500 computer at $300. Check them out at www.powerisking.com. Note: If you have other experiences with gear, or something to add, drop us a line. We don't claim to know everything (we just imply it at times). Give us a pat on the back if you like the reviews, or a slap in the head if you feel the need!